BMW M4 Convertible revealed | What Car? 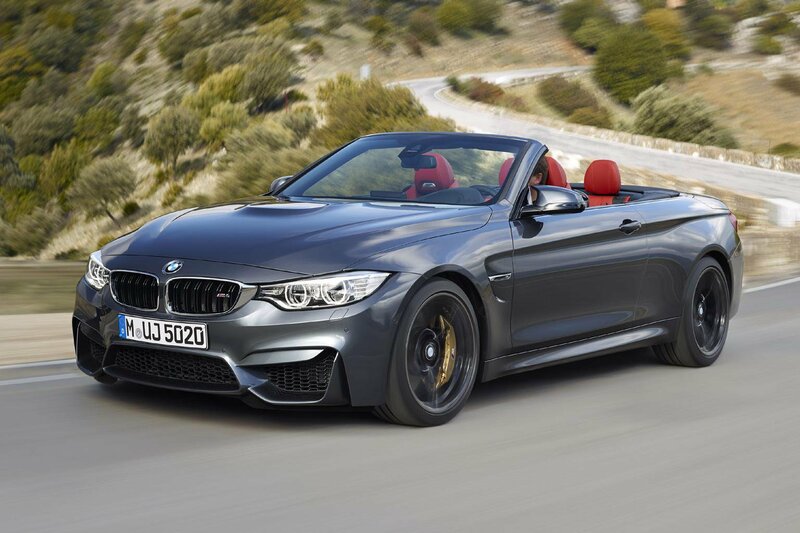 This is the BMW M4 Convertible, the high-performance version of the 4 Series Convertible. The announcement of the range-topping drop-top follows the introduction of the M3 saloon and M4 coupe at the Detroit motor show back in January. The convertible uses the same 3.0-litre six-cylinder engine as in the M3 and M4, so the headline figures are 425bhp and 406lb ft of torque. Choosing the standard six-speed manual gearbox means it achieves 0-62mph in 4.6 seconds with an official fuel economy figure of 31.0mpg. The optional seven-speed dual clutch auto (£2645) makes it even quicker, yet slightly more efficient (4.4 seconds to 62mph and 32.5mpg). CO2 emissions are 213g/km in manual guise and 203g/km for the automatic. Like the M4 coupe, the Convertible gets M-specific suspension with the adaptive set-up offering Comfort, Sport or Sport+ modes. It also gets more powerful brakes, which are lighter than in the rest of the 4 Series range. Carbon ceramic brakes are likely to be offered as an option. The cosmetic upgrades are substantial. It gets a large front splitter, the M 'powerdome' on the bonnet, flared wheelarches, dual twin exhaust pipes and twin-stalk door mirrors. The standard equipment includes 19-inch alloys, the Professional media pack, Bluetooth, all-round parking sensors and heated front seats. The folding hard-top roof can be lowered at up to 8mph, and takes 20 seconds to do so. The wider wind deflector and neck-warming Air Collar system for the front seats improve refinement and comfort. There’s no luggage capacity penalty for choosing the range-topping 4 Series Convertible; it gets the same 370 litres with the roof up and 220 litres when it’s folded away. While the BMW M3 saloon and M4 coupe will go on sale in June this year, the M4 Convertible won’t be available until September. It’s priced from £60,730.